Wow party guests with little effort. As parents, it's easy to feel pressured to throw our children perfect birthday parties they will remember forever. And, as a mom of two kids, I have had firsthand experience learning what works and what doesn't when it comes to birthday party entertaining. And I've realized: Parties don't have to be stressful! Here are my go-to entertaining tips to help your next birthday party or get together run smoothly. Even with a small gathering, dirty dishes pile up fast. To save yourself from a post-party sink full of dishes plus a full dishwasher, be sure to run and clear the washer before guests arrive. Prepare a family-friendly cheese platter or cheese-fruit kebabs. A cheese platter is a wonderful option for simple get-togethers as well as large parties. I like to serve unexpected but family-friendly and mild cheeses such as creamy Havarti or Gouda so even picky eaters are happy. Fruit kabobs offer a fantastic but simple way to serve fruit to kids. Layer grapes, strawberries, blueberries, or apples with your favorite kid-friendly cheese. The kabobs are perfect for grabbing and eating. (Just be careful that the skewers aren't too sharp and are safely discarded after use). Only place two items in the oven. In order to avoid a holdup at the oven, plan your menu to include no more than two items that need to be baked or heated. Unless you have an industrial-sized oven available (lucky you! ), it's difficult to time multiple baked items so they'll be ready for the start of an event. Plus, cold foods are incredibly kid friendly and easy to prepare ahead of the party. With these types of munchies ready in the fridge, you can quickly satisfy hungry tummies at a moment's notice. Don't fret about preparing a four-course gourmet meal. Instead, make memories with your child and enjoy interacting with your guests. My kids are constantly getting invited to birthday parties, and to ensure their own special days standout, I pick party themes that are as unique as they are. For inspiration, I look for theme ideas in the things my kids love, such as their favorite colors, books, animals, characters, etc. Once a concept is sparked, Pinterest offers additional resources to make the details happen. I usually try to carry a camera with me throughout the day to make sure I'm getting snapshots of special moments. Investing in a neck strap for your camera is worth it. It's a lifesaver to have your hands free and ready to fill an empty glass or help with opening presents. Another option is to ask family or friends if they can help out. If you have a friend or sister who is a great photographer, she might not mind taking a few pics so that you get plenty of photos with your little ones. And, I always try to capture a few pictures before the party starts (while the kiddos are still clean!). Don't serve anything that can't be eaten in two bites, especially if you are hosting an event where children will be running around and adults will be standing most of the time. It makes conversation much easier when you are not fumbling around with a plate full of food, cutlery, and a beverage. 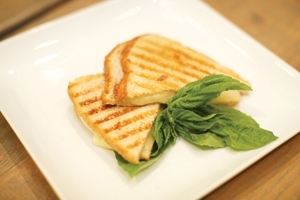 One of my favorite kid-friendly recipes is a Havartiand- Pear Grilled Cheese Sandwich that's cut into snack-size quarters. Place two slices of bread side by side, and spread the top of one with ½ tablespoon of butter. On the second slice, layer Arla Dofino Creamy Havarti cheese followed by the thinly sliced pear. Close the sandwich with the buttered bread slice, butter side up. Add the remaining butter in a nonstick skillet, and place it over medium heat. Swirl the butter so it coats the bottom of the pan. Place sandwich in skillet with non-buttered bread side down, and cook until the bread is toasted and golden brown (about 4 to 5 minutes). Flip the sandwich, and cook the other side for an additional 3 to 4 minutes or until golden brown. Remove from the skillet, slice into quarters, and serve. Whether it's your baby's first birthday or a neighborhood get-together, always do what makes you feel most comfortable, festive, and lets you enjoy time with your guests. Hopefully these tips will not only get you through your next event, but also help keep planning fun, simple, and stress-free. Kelsey Banfield is a mom and a foodie and believes these titles should never be mutually exclusive. She’s also the author of the Naptime Chef blog and cookbook The Naptime Chef: Fitting Great Food into Family Life (Running Press). Her blog features everything from family-friendly recipes to food articles.